The Libyan-Libyan Dialogue rival to the international community’s UNSMIL-brokered Libya Political Agreement took a step forward today when members of the House of Representatives agreed to set up a joint committee with the rump of the General National Congress. 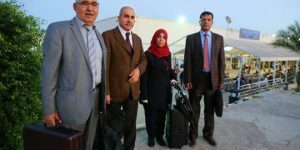 A four-strong delegation from the Tobruk parliament had reportedly arrived with a mandate from HoR president Ageela Saleh to talk to their GNC predecessors. Among the stated aims is the creation of a functioning unity administration. This would embrace Abdullah Thinni’s Beida-based government and the erstwhile National Salvation Government led by Khalifa Ghwell which in October spluttered back to life when supportive militiamen grabbed the old GNC chamber at the Rixos in Tripoli. The HoR team today was headed by Abu Sleem member Saad Al-Marimi and two colleagues from Zawia, Salim Ganidi and Abdulnabi Abdulmuali. The only legislator from the east was Benghazi women’s list member Aisha Al-Tablaghi. This quartet is to be joined by four from the GNC on a committee charged with working out the technical and legal implication of a merged Thinni/Ghwell administration. It is unclear who will be the GNC members involved. It is not known what part Thinni has played in the despatch of the HoR delegation. After the Rixos coup, Ghwell himself first proposed his NSG work with Thinni. The prime minister was not dismissive but did insist however that Ghwell recognise the HoR as the sole legitimate parliament. The joint committee seems to have been set some unrealistic timings for what is likely to be a complex task. Marimi said after his meeting with the GNC that he and his colleagues planned to submit an initial report with a week. He added: “We also have agreed that the Libyan-Libyan dialogue committee will meet within three days after receiving the report”. It would then take a view and forward its thoughts to Ageela Saleh and the HoR.